Available on paper stock containing 30% recycled post consumer fiber. Free 4-color process imprint standard. Imprint Area: 3 5/8" x 2 5/8"
Imprint: Price includes a FREE 4-color process imprint! 4-color process allows you to print as many different colors as you want for one price! All PMS colors will be converted to the closest 4-color process match. A perfect match cannot be guaranteed. Click here for standard imprint colors. Shipping: Catalog quantities ship in only 5-working-days! 2-day service at ground rates. BIC Air Express 1 Day Air. Since BIC Sticky Note products are heavy, please Click here for complete shipping information. Combination Packaging: Pair any BIC Sticky Note pad with your favorite BIC pen to create a unique combo package! Click here for details. 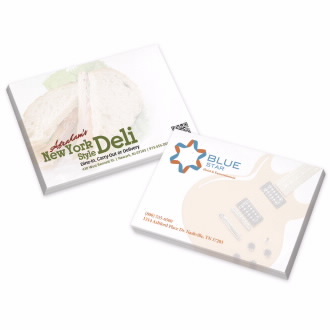 *This BIC Sticky Note product is made with paper stock containing 30% recycled post-consumer fiber. Please specify recycled paper on your order. White paper only. See page 7 for details. When ordering between quantity breaks, orders must be placed in 500-piece increments. Add Color with a FREE Flood Coat!